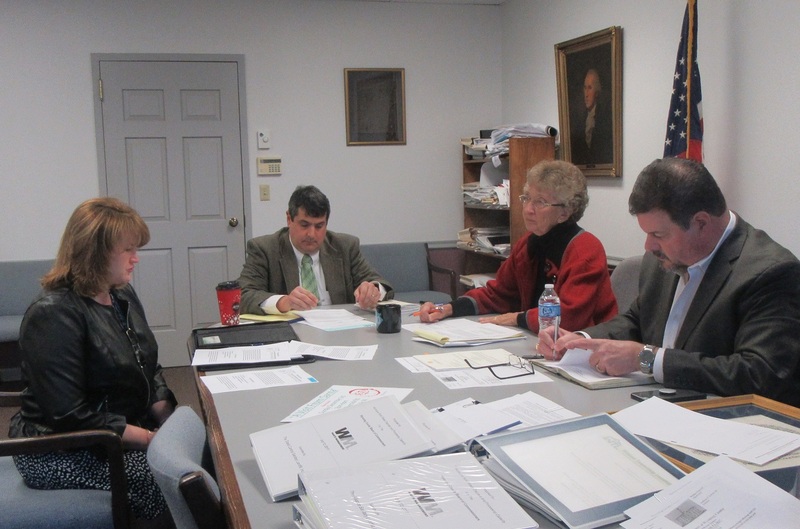 Wyoming County Housing & Redevelopment Authorities grants administrator Lisa Hahn (top, left) distributes an agenda to county commissioners (from right) Tom Henry and Judy Mead and solicitor Paul Litwin concerning 2017 CBDG applications. 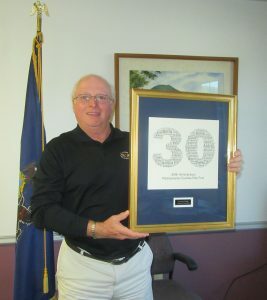 Wyoming County chief clerk Bill Gaylord (above) displays a plaque presented by the County Commissioners Association of Pennsylvania acknowledging the county as a charter member of the liability insurance pool called PCORP. The Nov. 28 meeting of the Wyoming County Commissioners opened with a public meeting of the Housing & Redevelopment Authorities (HRA) during which grants administrator Lisa Hahn announced that applications for 2017 Community Block Development Grants (CBDG) will be accepted through Friday, Dec. 15. The applications will be reviewed by the HRA and brought back to the commissioners for approval on Tuesday, Dec. 26. Just over $222,000 has been allocated for grants, which can be obtained for projects under the following categories: housing infrastructure, economic development, and public services. These include but are not limited to demolition of blighted properties, handicap accessibility, infrastructure projects, planning and activities, and code enforcement, Hahn explained. Applications must meet one of three national objectives: benefit to low- to moderate-income (LMI) persons, elimination of slums or blight, or urgent need. On the latter, Hahn offered failing infrastructure such as a water or sewer system as an example. To meet the national objectives as determined by HUD, grantees must expend no less than 70 percent of the funds for projects that benefit LMI persons. The remaining 30 percent can cover administrative and audit fees. Though the window of opportunity always seems slim, municipalities and other interested parties are encouraged to submit applications, as remaining funds will be otherwise deferred to the County-Wide Housing Rehabilitation Fund after Dec. 26.The number of grant applications submitted for this program seldom matches the funds available. Private properties may benefit from the grants, Hahn noted, but an agency or municipality must complete the application on behalf of the owners. After the advertised public meeting had been completed, Hahn remained to field some questions and concerns about HRA by citizens in attendance. Most of them came from Forkston resident Louise Kling, who has been questioning the Authorities’ ethics and transparency for months as they pertain to funds earmarked for victims of the 2011 floods. She noted that her repeated requests for a copy of the advertisement for the first public meeting at which $500,000 in disaster relief funds was to be moved to a housing project had not yet been granted. Kling also related that she was having a tough time getting through to the Housing & Redevelopment Authorities office, noting that there was often no answer at all and that her calls were not being returned when she was able to leave a message. In particular, Kling was trying to make sure last week that there was a public meeting of the HRA scheduled for Nov. 22. The web page for the Authorities indicates that the public meetings are held on the third Wednesday of each month, which would have been Nov. 15. Nonetheless, a meeting was held on Nov. 22 which she had hoped to attend but didn’t want to drive an hour without confirmation. Hahn apologized to Kling for the difficulties she had experienced reaching the HRA office and gave her a direct line to Hahn’s desk. In other news, the commissioners approved a pair of property inspections to detect lead-based paint as per the Housing Rehabilitation Program. A new grant agreement with PEMA was signed that assures the county’s cooperation with a large emergency services inter-connectivity project that is expected to be completed by the end of 2018. Commissioner Tom Henry deferred questions about the NorthCom Regional CAD project, which will cover Bradford, Potter and Wyoming counties to 911 director Jeff Porter, who was currently out of the office. The commissioners accepted a bid by Stanley Security to replace a deteriorating control panel at the Wyoming County Prison. The new panel will replace one that has been used to control security and other functions at the jail for the past 10 years that has been upgraded as many times as it could be. The $52,000 will be factored into next year’s budget, and the panel will take about three months to build. Chief clerk Bill Gaylord announced in his report that Wyoming County has been acknowledged as a 30-year member of PCORP, a liability insurance pool sponsored by the County Commissioners Association of Pennsylvania (CCAP). “We’ve been charter members since 1987 with the Pennsylvania County Risk Pool,” Gaylord explained in a separate interview. “I’ve been fortunate to be part of the board for the last 23 years, which I’ve enjoyed thoroughly.” PCORP supplies general liability, auto liability, property coverage, and crime coverage to county governments from its office near Harrisburg. A draft of Wyoming County’s 2018 budget will be available for inspection as of Wednesday, Dec. 5 in the commissioners office. Henry noted that all of the departments were still tweaking their numbers, but the document should be available for review on time. The budget will be brought up for approval at the Dec. 26 commissioners meeting.